The process of electrolysis breaks water into smaller units, which can penetrate cells much more efficiently than normal water. The “Ionized” Water is freshly re-organized water which penetrates the cells at a much faster rate for better nutrient absorption and more efficient waste removal. 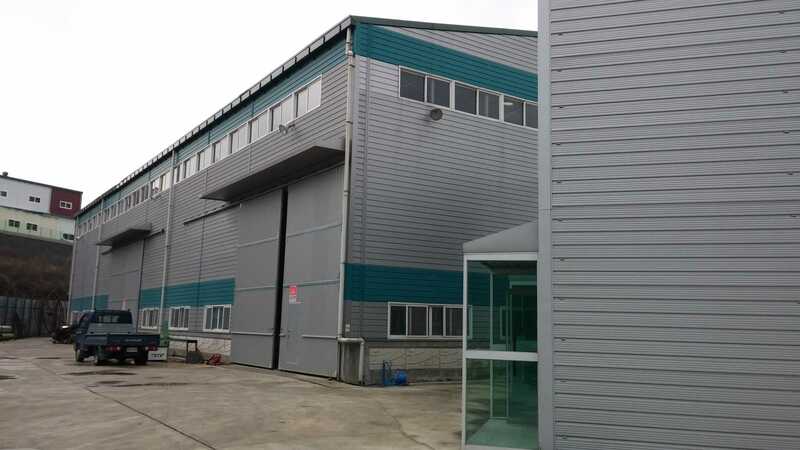 Smaller water units also have a positive effect on the efficiency of the metabolic processes. Then how the ionization affect the molecular structure of water is that Water that enters the electrolytic cell is subjected to a small electric current which passes between the plates, causing the water molecules [H2O] to split into two ions: a negatively charged hydroxyl ion [OH-] and a positively charged hydrogen ion [H+]. Pure water – i.e. distilled water – is an insulator and cannot undergo significant electrolysis without adding an electrolyte. Then what helps to electrolyze the tap water for drinking? That is the minerals dissolved in water, Ca+, Cl-, K+, Mg+… different in every land. The Minerals work as conductor when electrolysis takes places from a water ionizer. 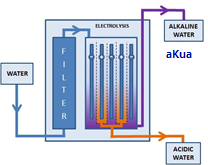 aKua® is a brand name of KTCC’s Water Ionizer. It comes from aQua + alKaline Water. Water enters the ionizer through an inlet port the unit and is first filtered to remove common pollutants, particulate matter, chlorine, odor and organic matter present in tap water. STEP 2: ELECTROLYSIS [ Water Ionization ] The water then flows through an electrolysis chamber which contains positively and negatively charged platinum-covered titanium electrodes. These electrodes ionize the soluble minerals in the water: positively charged ions gather at the cathode (negative electrode) to create alkaline water, also referred to as “reduced water” while negatively charged ions gather at the anode (positive electrode) to make acid water, also known as “oxidized water”. • ALKALINE WATER, which comes out of the top spout on the ionizer, is the fraction that we drink and cook with. It contains a high concentration of positively charged minerals that are beneficial for our health, such as calcium, potassium, and magnesium. • ACIDIC WATER, which is dispensed through the bottom hose or spout, is used externally for cleaning and disinfecting the skin and household surfaces. It is discharged into the sink when it is not needed or saved for later use. How does ionization affect the molecular structure of water? Water that enters the electrolytic cell is subjected to a small electric current which passes between the plates, causing the water molecules [H2O] to split into two ions: a negatively charged hydroxyl ion [OH-] and a positively charged hydrogen ion [H+]. • The alkaline water stream contains a larger proportion of hydroxyl ions [OH-] which act as a powerful antioxidant, or reducing agent, because these ions have spare electrons that can easily be donated to our cells. Antioxidants neutralizes the oxidative damage caused by electron scavenging free radicals in our body. • The acidic water stream contains a larger proportion of hydrogen ions [H+] which, contrary to hydroxyl ions, act as a oxidant or good for skin cleaning.